This post originally appeared at http://www.feedhenry.com/tablets-support-for-business-lags. With Apple announcing their latest iPad tablets, Red Hat’s FeedHenry team commissioned research firm YouGov to poll the attitudes of American consumers towards today’s tablets, looking at both personal and business use. Results of the research revealed some very interesting highlights especially consumer sentiment toward tablet features and tablet preference. Additionally, and of great interest to the FeedHenry team as a mobile app solution provider to enterprise, is the degree to which tablets are being supported in the workplace. There is great active interest in the tablet market with one in six (17%) Americans planning to purchase the new iPad Air, and more than half (56%) indicating that they might purchase the new iPad. Watch out tablet vendors, this could be a booming holiday season. The enterprise does not yet adequately support worker tablet use. 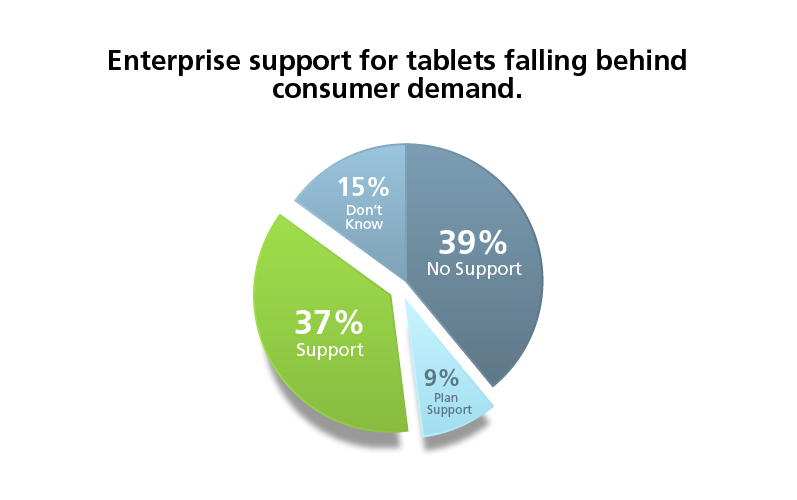 Despite this interest, businesses lag in terms tablet adoption, with approximately a third (37%) of Americans reporting that their organization offers support for tablet devices and fewer than one in ten (9%) planning to support tablets in the workplace. Memory storage deemed most important feature across all tablets Approximately one in four (26%) American consumers name data/memory storage as the most important tablet feature. One in five (20%) of those using a tablet as a personal device ranked battery life as the second most important feature, followed by the tablet running on the most recent operating system available (18%). If you thought consumers were hooked on camera features or screen size, think again. In the workplace, similarities remain on feature preferences with data/memory storage topping the list again at 26%; and most recent operating system and battery life coming in equally at 17% each. Lower down the popularity list were fingerprint recognition (10%); screen size (9%); weight and portability (6%); screen resolution (4%); camera capabilities (2%). In the U.S., consumers show near equal preference for Apple and Android tablets for personal use. Both Apple and Android-based tablets were identified as the preferred tablet by 30% and 32% of survey respondents, respectively, with Microsoft Surface tablets 11%. Across workplaces, Apple tablets parallel personal preference (30%), with Android in second (25%) and Microsoft in third (19%). 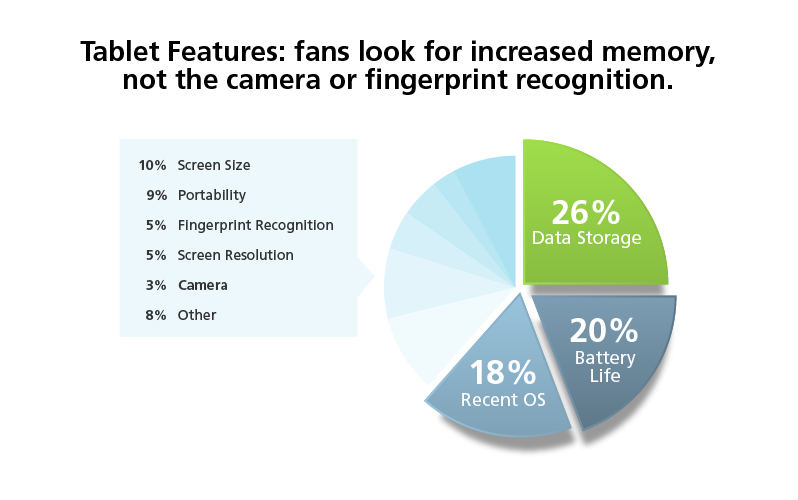 Despite recent security concerns around devices and mobile solutions, fingerprint recognition named least important tablet feature – Regardless of brand, Americans rank fingerprint recognition as the least important tablet feature when using devices personally (29%), demonstrating that fingerprint recognition is perceived as a small building block in mobile security. Twenty-two percent (22%) say camera capabilities are least important – in the workplace, Americans rank cameras as the least important feature overall (29%), followed by fingerprint recognition (17%) and weight (17%). We believe tablet use in the workplace is falling behind consumer use because many businesses are still grappling with the rapid pace of mobile innovation and the continuously changing device landscape. On Red Hat’s FeedHenry team however, we are increasingly seeing larger organizations look to tablets as an ideal form factor for use in field service, sales, logistics and many other areas of business operations. Features such as increased memory, camera capabilities and security features can help expand tablets to a broader base of mobile business applications that help drive increased value for an organization. These features, combined with the power of real-time data connectivity, can make tablets a powerful business tool. Red Hat's FeedHenry team commissioned YouGov PLC—a third party, professional research and consulting organization—to conduct an online poll of 1,164 U.S. adults from Oct. 8- 10, 2014.